Are you seeking to improve your economic status and are the sole financial support for your children, parents or other family members? Unlike other award programs, the Live Your Dream: Education and Training Awards for Women (formerly the Women’s Opportunity Award) can be used for books, child care, transportation or other expenses that will help a woman reach her educational goal. The program begins at the club level. 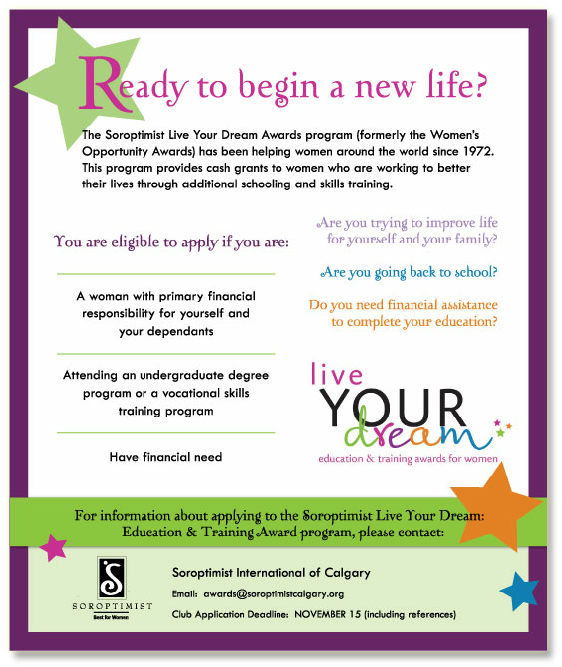 Soroptimist International of Calgary award recipients are eligible for a single $3,000 or one of two $1,500 awards. Club-level recipients become eligible for additional awards at other levels of the organization. finalist awards each year through the Live Your Dream: Education and Training Awards for Women program. The Live Your Dream: Education and Training Awards for Women helps women to improve their education and job skills so they can build a better life for themselves and their families. Read their stories of overcoming obstacles – they are inspiring.